Many of our classics come from a simpler time, an era before hybrid drive systems, automated lift gates and computer-controlled seat warmers. Of course, we’re able to enjoy our cars even though they can’t communicate with satellites, keep our beverages chilled, or automatically dim the rearview mirror. Still, wouldn’t it be nice to take advantage of recent developments? Air conditioning, for example, would be a welcome addition to many of our classics, especially in the summer months or during springtime downpours. A few power adders under the hood would come in handy, too. And who wouldn’t embrace better brakes and safer tires? Today’s automotive aftermarket is here to help. While some owners prefer to keep their cars completely period-correct, others are willing to make a few changes. Fortunately, a raft of new parts is available to make our old cars faster, safer and more comfortable—all worthy goals in our book. Supercharging has been part of the automotive scene—both factory and aftermarket—for decades. While those old Judson units offered much promise, they usually lacked the technology to make huge power gains. Welcome today’s supercharger kits: modern, power-adding blowers often teamed with vintage looks. 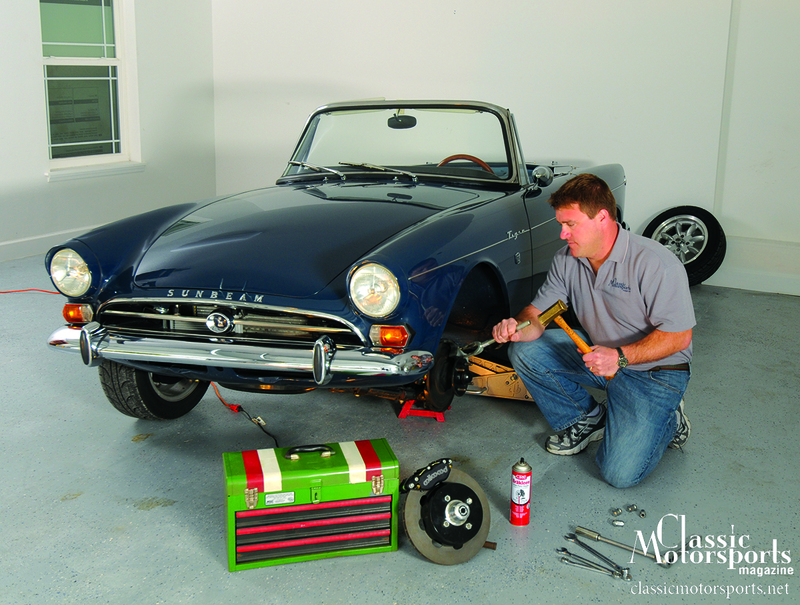 Moss Motors has developed kits for most of our favorite little British cars, including the MGA, MGB, Spridget, TR4 and TR6. It’s kind of hard to enjoy a drive when your car is marking its territory with a stream of coolant. Whether that original radiator was marginal from day one or has just been beaten down by years of neglect, modern solutions are available. The top-shelf aftermarket replacements are usually made entirely from aluminum, and the benefits include lower weight, greater efficiency and longer life. Upgraded lighting doesn’t just exist for the nose of your car. Brighter illumination for the rear is out there, too, as British Automotive and Classic Auto LEDs both offer LED tail lamp kits for most popular British cars, including the MGB, TR6, XK150 and Midget. Brake technology rarely sits still, as we’re constantly presented with new choices. Today’s pads offer great modulation over a wide temperature range. The latest development is ceramic-based pads: excellent performance without the black dust. Yeah, yeah, we know that the best automotive sound system is a burbling exhaust teamed with some side-draft carburetors. However, those who like a little music while they drive have had to make compromises: the meager original system or something that sounds great but looks much too modern. If only there were a better option. Well, friends, there is. Custom Autosound and RetroSound both offer vintage-looking head units stuffed with modern features, including iPod input jacks. There is also a more involved solution for better stopping power: larger rotors and aluminum multi-piston calipers. This setup can shed unsprung weight and allow the system to tolerate higher braking temperatures. Despite the number of parts involved, big brake kits are sometimes just a bolt-on affair thanks to the aftermarket. Carburetors are so 20th century. Why not try a modern fuel-injection system that can offer gains in performance, efficiency and emissions? Plus, you won’t need to adjust it as you travel from sea level to the top of a mountain. Adopting fuel injection isn’t always easy, however; not many turnkey kits currently exist for our market. Patton Machine Products offers a GM-based conversion kit for the Triumph TR6, but that’s one of the few options. It even looks like the stock carbs. Another option is to simply swap to a late-model engine—that move usually nets newer technology from oil pan to intake manifold. It may not please the purists, but swapping a Miata inline-four or GM V6 into an MGB is a relatively easy proposition. On a similar note, we’re seeing more early Jaguars powered by later drivelines. Sure, those sealed-beam headlights purchased at Wal-Mart only cost a few bucks each, but do they offer the best performance possible? A better option exists: halogen headlamps that use a replaceable bulb. They feature better optics that shed more light where it’s needed—like on the road. These European-spec lamps simply replace the standard sealed-beam units. If there’s a downside, it’s the lack of DOT approval. For a legal compromise, check out the Hella Vision Plus lamps. They offer European-bred technology plus the U.S.-mandated aiming tips. An engine rebuild is usually a big job. If you’re willing to put forth the time and money, why not maximize every possible option—especially on a racing or severe-use application? Today’s high-performance engine coatings can reduce friction and block excessive heat transfer. These coatings aren’t terribly expensive, either, assuming the engine is already apart and the parts have been cleaned. Applying both a thermal barrier and moly coating to pistons, for example, can easily cost less than $50 per cylinder. Updating a charging system from a generator to a later, more efficient alternator has been a popular modification for years, but an alternative now exists for those who prefer the stock looks. The Powermaster PowerGen looks like a generator but houses a modern alternator. Current applications cover older GM and Ford cars. Even today’s garden-variety passenger car tires can easily outperform yesterday’s performance rubber. On a related note, old rubber, even if it sports plenty of tread, cannot be trusted to deliver safe, consistent performance. While many modern tires don’t come in sizes that are well suited to our older classics, there are some solutions. First, specialists like Coker Tire, Universal Tire and Lucas Classic Tires offer brand-new tires that faithfully duplicate past models, including favorites from Michelin, Goodyear, Pirelli and BFGoodrich. Plus, all three companies offer their own house brands that capture yesterday’s looks. The third solution is a modern radial with a vintage face—specificially those from Vredestein. Vredestein now offers three period-correct radials for our market, including a snow tire. Ah, wheels. All that mounting and dismounting causes wheels to wear over time, never mind the occasional impact with a solid object. As a result, wheels should be considered a wear item. When you need to replace them, which will it be: period-correct looks or something more modern? For the classic look, brand-new wire wheels are still being produced. Dayton Wire Wheels, Wire Wheel Source and Moss Motors can help. New wires can replace old ones, or cars originally fitted with steel or mag wheels can be upgraded. Wider-than-stock sizes are also available for those looking for a stealthy upgrade. Several options exist for those seeking the classic eight-spoke, Minilite-style mag wheel. In addition to the genuine article—imported to the U.S. by TargettMotorSport—other choices include the VTO Classic 8, Rota RB, König Rewind, and various Panasport models. Moss Motors also offers a few options in this style. Looking for something a bit more ’70s? BBS still offers many of their classic alloys, and several can be found in their appropriately named Classic Line. Porsche owners have unique wheel needs thanks to the offset and bolt patterns used on those cars. While the original Fuchs wheels are no longer in production, several companies offer “tribute” models, including Zuffenhaus Products, Rota, Euromeister and Jeff Alton. Lindsey Racing and TruDesign can both widen the stock Fuchs. Those with the fender clearance can go with contemporary forged wheels. While the looks are often striking, these wheels are more than just automotive jewelry. They provide less rotating mass and increased strength. Start your search with Forgeline, BBS, HRE and Complete Custom Wheel. Finally, American Racing has put several classic designs back into production, including their Torq-Thrust and 500. American Racing has also rereleased the classic Ansen Sprint Slot Mag. Old, worn-out shock absorbers don’t do anything to help performance, as they can’t properly damp the motion of the springs. Handling, braking and even acceleration all suffer. While modern dampers may not look correct on an old car, some solutions exist. Koni can rebuild just about anything from their past catalog to modern specs, and their comprehensive restoration process includes a period-correct paint job and decals. Bilstein can also renew their old shock absorbers. For those who want to simply fit new units, both brands also offer current choices that would look appropriate on a 40-year-old chassis. Ignition points wear out over time. To be honest, they’re not the ideal solution even when new. There’s an easy ignition upgrade: Toss the original points and replace them with a PerTronix Ignitor. This stealthy upgrade replaces old-fashioned points with a modern, sealed Hall Effect circuit that’s impervious to dirt and moisture. On a related note, replacement Lucas distributor rotors have left more than one classic enthusiast stranded. Advanced Distributors have engineered a replacement that aims to eliminate the problems associated with other options. Hotter aftermarket ignition boxes don’t have to look out of place, either. MSD is making 4000 copies of their retro-flavored 40th Anniversary 6AL Ignition Control. Each box even comes with some vintage MSD stickers. You no longer have to sweat while enjoying your classic car. Bolt-in air-conditioner kits that use modern compressors and evaporators are now available. The trick is finding a vendor, as there isn’t a one-stop solution for every make and model. British AC specializes in kits for MG and Triumph cars, while Vintage Air caters to the domestic pony and muscle car market. Moss has an MGB solution. Jaguar and Porsche 911 owners can turn to RetroAir for relief on those steamy summer days. Today’s traffic moves quickly, and buzzing along at 4000 rpm can turn a weekend outing into a stay in the penalty box. A different final drive ratio or taller rear tires can offer relaxed cruising, but acceleration will suffer. A five-speed gearbox, however, provides the best of all worlds: a modern, fully synchronized box fitted with an overdrive cog. The vendors tend to specialize in their comfort zones: The Driven Man and XKs Unlimited serve the Jaguar market; MG Five Speed Co. and Moss Motors can help those with various MG and Triumph models; HVDA has a Triumph gearbox; and Hurst Driveline Conversions works with GM and Mopar products. Watching those timeless Smiths and Jaeger gauges keep tabs on everything is part of the joy of owning a classic sports car. However, these devices aren’t immune to the ravages of time. Plus, some older tachometers aren’t compatible with modern ignitions. Nisonger can help in both instances, as they rebuild old gauges and update vintage tachometers to work with today’s ignitions. Steering wheel technology hasn’t changed that much in recent years—round and comfortable is still the norm—but an aftermarket unit can easily improve looks and comfort. Wheel too close to the dashboard? Many aftermarket setups can accept a spacer. The result is a bit more room for your fingers. An aftermarket steering wheel can also offer the chance to change the diameter: smaller for a sportier feel and more leg room or larger for increased leverage. Moss Motors carries wheels that are appropriate for British rides, while Momo, Nardi and Sparco can help all makes and models. Quick, is your car running rich or lean? Knowing the answer can be the difference between your engine’s life and death. In the old days, we’d sniff the tailpipe and maybe check the plugs to get an answer. Today, technology has the solution: Enter the wide-band oxygen sensor. These kits include everything needed, starting with a sensor that can track the engine’s air/fuel ratio to one decimal point. Then there’s the rest of the system, including a hand-held display unit or a gauge that can be permanently mounted. Innovate Motorsports, Zeitronix and AEM all offer comprehensive solutions. If given a choice, most of us would favor a cool, quiet cockpit. Today’s solution is a couple of yards of flexible, foil-backed insulation material. These heat-reflecting materials are thin and easy to install. Thermo-Tec, Eastwood and others can help. Modern aftermarket buckets can feel great and replace those old, tattered seats. However, the latest models usually don’t look correct in an old car. Enter modern seats built with older looks. Fortunately, Cobra, Corbeau and GTS Classics all offer such solutions. A lot of classics were delivered with big, heavy starters that require a lot of juice to spin. Their replacement, the modern gear-reduction starter, is just the opposite: These units weigh less and are easier to turn over. Thanks to the aftermarket, adapting this piece of late-model technology to an older classic is now a bolt-on affair in many cases. Gustafson Specialty Products, Moss Motors and Victoria British can help with such upgrades. Today’s aluminum cylinder heads have two major advantages: better breathing and reduced weight. The Pierce Manifold head for the MGA and MGB also exchanges the original reverse-flow setup for a more efficient cross-flow design. These heads have been redesigned so that the intake and exhaust ports are no longer seated beside each other. Victoria British and Moss also sell a cross-flow head for the MGB. The same global positioning system technology that guides missiles, finds missing pets, and helps everyone get to Grandma’s house on time can also be used to maximize track time. GPS-based data acquisition systems are compact and easy to use: Attach the unit to the car, plug in the antenna, and then head off for a session. On-board accelerometers contained within the unit combined with the GPS info can yield much information, including a car’s speed and position anywhere on track. Names to know when shopping: Traqmate, RLC Racing, ChaseCam, Race Technology, Race-Keeper, Competition Data System, MaxQData and AIM Sports. On-board video isn’t limited to the professional ranks, as anyone can pick up a compact, solid-state recording system for less than a grand. Instead of bulky cameras and finicky tapes, these new systems feature tiny cameras and digital media. They’ll add only a few ounces to the car while recording every apex, upshift and checkered flag. Late-breaking update: High-definition systems plus setups that combine video and data have also entered the market. Budget about $1500 for a system that has all the bells and whistles. Who to call? GoPro as well as any company that also provides the GPS data systems. Did you know that the prices of head-and-neck restraints have fallen well below the thousand-dollar mark? The amateur driver now has one fewer excuse for taking to the track unprotected. These restraints are relatively new to motorsports, but they’re already credited with preventing many neck injuries by simply limiting how far the head can move during an impact. Airplane pilots have been using computerized simulators for years, and the logic is simple: Tackle the learning curve in a safe, controlled environment. Today’s vintage racer can do the same thanks to advances in computer software, and one of the most popular platforms is iRacing. Whatever you do, though, don’t refer to it as a video game. iRacing is a serious PC simulator that features painstaking digital recreations of many famous racing circuits, including Virginia International Raceway, Watkins Glen, Lime Rock Park and Daytona International Speedway. Nothing improves the breed like competition, and iRacing also features its own racing leagues. Thanks to iRacing and a fast Internet connection, it’s possible to race against—and learn from—some of the top pros in the business. Driving suits have steadily gotten lighter, safer and more comfortable. There’s no reason why the vintage racer has to look like someone headed to a Formula 1 grid, though. Some companies are packing their latest advances into suits with spot-on vintage looks. Join Free Join our community to easily find more Sunbeam articles.